This thread is for letting others know what you purchased in the 5 Item challenge discussed in Episode 70 of the survival podcast. Post items, costs, reviews of quality and ideas for recipes here for items that are part of the 5 item challenge. OK let's get this thing rolling, as you post items try to follow the format I am about to use. Post price, servings per container, price per serving, where you bought it and your thoughts after trying it etc. To keep things consitant just copy the line items below, paste em into your new post and edit each to fit your item. Pictures are cool but you don't have to provide them, remember you can often get a pic off the manufactures web site if you don't want to provide your own. Lets try to do one post per item rather then one post with 3 or 5 items etc. This was the first time I saw dry soy beans marketed as "Dry Edamame" so I gave it a shot. Chief Advantages - Easily stores a full year or more, good source of protein and nutrition, good balance of protein, fat and carbs, no prep needed. No additives or other nasty stuff in them, low price per serving. Disadvantages - Wife doesn't like them won't even really try them open minded. They are something may may feel that way about I guess. Uses - direct snacking, make your own trail mix (nuts, raisins, grains, etc added), awesome salad topping, snack mix item as well, would be good at a party in a bowl with pecans and cashews. They are very good and bigger then most "soy nuts", quite a lot like fresh Edamame so they deliver what is promised. My Opinion - If you like "soy nuts" you will love these, just enough salt for good flavor, some may want to add more. Definitively a winner for me but we will only store one or two because my wife is not fond of them yet. I think she will like them when I whip up a salad topper with them though. Disadvantages - Not as cheap as homemade and have a limit to nutritional value, however, the prep time makes up for any additional cost over making your own. Uses - As a starch component of a meal, would be good for many toddlers as a step up from baby food. Would be great for sheppards or hamburger pie type dishes or anything topped with potatoes. My Opinion - About the best potatoes I have ever made from a dried bag mix in my life. To improve them use a tad more water then suggested. A bit of milk would make them even better. Try it you will like it. Prep is boil water, remove from stove, add potatoes, fluff and let stand covered for 5 minutes. Took longer to write this review then to make these. Excellent storage food! Let me also state I think three servings per package for hungry adults is a bit more of an accurate way to view the size per pouch. Source - Ingles, Wal-Mart, ect. Chief Advantages - Stores for over a year if kept in a cool dry place. I did some research and Lentils have as much vitamins and minerals as soybeans. They are very nutritious and can be used in so many things from soups, to dishes, to salad topping (cooked of course). They do not require pre-soaking so they are good for on the go. They are not big bulky beans. Disadvantages - They are beans and some people may get tired of them after awhile.. They require alot more water and cooking time than most beans (depending on how soft you like your beans). I cooked them along side white rice the other night and it almost twice as long to cook the lentils with double the water. 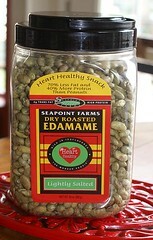 Uses - This is a good protein bean which has alot of nutrients in it. They can be cooked as is or they can be cooked and mashed into a paste and seasoned. They can be put into many dishes to enhance their flavor or their texture. My Opinion - I like this bean probably better than the other ones I have tried so far. They are delicious and can be a part of many recipes to add protein, and nutrients without sacrificing taste. I think I am going to make this a permanent part of my supplies. 2 cups short grain rice. Cook rice and lentils in seperate pots. Lentils should be in a larger pot for when you mix the rice in. Once rice is done put it to the side. Make sure to add at least one extra cup of water to the lentils. While lentils are simmering add the salt, garlic, cayenne pepper, and beef stock. When the lentils are done there should be at least a cup of water left above the lentils. Take the rice and mix it thoroughly in with the lentils. The rice should soak up the rest of the water while you stir. Turn off the heat and let it sit so it will soak up the water. I am not sure what I would call this, but everyone loved it when I made it the other night. It is spicy, but not too hot (at least for me) and it was flavorful. I am not sure how many this serves, but I have half a pot left over and we ate alot of it last night. I know I had three large servings, and my fiancee had at least two big servings. I would say that it would feed a family of five with everyone satisfied at the end. Disadvantages - Relatively expensive, lot of packaging not great for environment. Uses - Quick and easy snack needing no preparation. 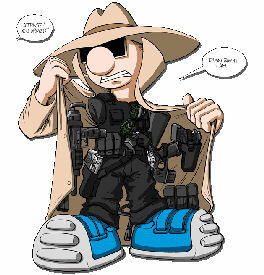 Great to throw a couple in a backpack/bug-out bag. Good to stick a few in the car. Uses - put on crackers or in a sandwich. Chief Advantages - Easily stores a full year or more. No best by or expiration date. Pull tab top. Disadvantages - Fatty and salty, but pleasantly so. Chief Advantages - Stores well, just like pasta, and can made quickly and easily. It is small enough to have alot of couscous in a small place. Add spice to it of any variety (in this kind it is curry) to flavor it. It is like having smaller more portable pasta. Disadvantages - I honestly can't think of any. Uses - It is good by iteself or on top of dishes, in soup, or anything you can think to do with pasta. My opinion - This is awesome stuff. I didn't know about this until my mother made it one day. The curry one is awesome, but so are the other versions. You can even buy couscous without herb mixes in them. I would love to buy some to make a permanent part of my stock. I suggest anyone to try it, and I can almost guarantee you that you will love it. I removed the random chatter to keep this post on topic & in a database format. Please gear all posts towards building a base of information so others can easily use & add to this resource. Remember, Jack has outlined the format, please follow the directions he provided. Superfluous posts will be removed. Thanks for contributing & making this a great site. Uses: By itself or with flavoring/dried fruit/etc. My Opinion: I enjoyed this. I've had the other Quaker Instant Oatmeal flavors, but this is the first time I've seen it without flavoring added, which I prefer. While it is more expensive than regular oatmeal, the price really isn't that bad for the convenience. Chief Advantages - The chief advantage to these taters are that they can keep for a long time. They have a 'best before' stamped on it so they won't go bad after the date. This is a large bag for the price. You can store this with your other preps and not worry because all it takes to make them into steaming hot mashed potatoes is boiling water! I looked at the ingredients and there is some milk powder in it. Great for a hot fast meal. Disadvantages - The biggest disadvantage I can think of is if you don't have any salt or butter on hand. Uses - You can also use it to thicken foods you are making. Just about anything you can do with mashed potatoes you can do with this. My opinion - This is an awesome product for the price. I have been looking for something like this in mashed potato variety. It was tucked away near the products they have in Wal-Mart that come in gigantic sizes like Ketchup, Mayo, Pickles, Canned Cheese, things like that. It is filling, you can take it with you anywhere, and it will be a part of my permanent stock and supplies here. Chief Advantages - Small easily storable foil pack about the size of a check book wallet. High carbohydrate & protein content per serving. Very filling. Disadvantages - Takes 3 1/4 cups of water to fix. High sodium per serving (890mg) could be good, or bad based on individual dietary requirements. Beans are the musical fruit. Uses - Easy to store several foil packs in a small space & it's great for a quick meal. Shelf life is a year to two years so it could be cached long term or rotated thru the daily meal menu. My Opinion - It is possible to get your belly full with the red beans & rice alone, but add sausage or another meat while it's simmering & you've got yourself a really tasty meal. This is a product I'm going to be buying regularly. Chief Advantages - Small easily storable foil pack about the size of a check book wallet. Super high, good carbohydrate content per serving (43g). Low in fat (0g), low in trans fats (0g), decent protein source (4g) per serving. Disadvantages - Takes 3 1/2 cups of water to fix. High sodium per serving (990mg) could be good, or bad based on individual dietary requirements. My Opinion - Not as good as the red beans and rice I tried. Good taste but kind of bland if eaten alone or without another dish. It'd be great with some chicken, maybe cooked in a Pyrex dish with the chicken & some broccoli mixed in. It does have a pretty yellow color if you need to add a little pizazz to the dinner plate. All in all it was a good product & I will be keeping it in the regular food cache. I recommend it. Chief Advantages - Easily stores 4 years or more, good source of protein and nutrition, high in omega 3 (the good fat), no prep needed. Contents-Pink salmon and salt, low price per serving. Chief Advantages - Quick and easy chili, toss in a can of rinsed beans. No meat needed. Good cold or warmed up. Other uses - makes a good base for salsa - add corn, black beans, cilantro, onions, etc. also good on omletes or scrambled eggs. breakfast burritos, bean burritos, etc. Chief Advantages - Quick and easy to prepare, stores well at least until opened. 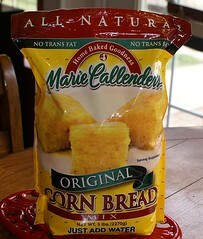 Taste exceptional and has may uses beyond just corn bread. Disadvantages - Not as cheap as from scratch, if stored you will need to put it in something hard to prevent rodent/insects from getting through the plastic bag. Uses - Clearly to make corn bread, muffins etc. Fried you can make great hush puppies with it. You can add canned corn and peppers for a bit of flair. Good source of carbs and a bit of protein too. My Opinion - We have a new favorite for a bread with dinner beyond fresh loaves and or biscuits. Try this with beef stew or chili (crumbled in), I also think I may come up with sort of a chicken enchilada bake using this instead of tortillas. Anyone can make this stuff, mix water in and bake. So you do need a water and heat source but for a bug in that should not be one of your problems. It will also make an awesome fry mix for fish and or chicken (haven't tried yet but I have no doubts). At 9 cents a serving how can anyone complain. This is a winner. Serve family style in the center of the table, one dish and everyone shares. Great night around the table and a good way to handle left over stuff too. to come up with a solution for no buttermilk. Here's my recipe for buttermilk biscuits and I use the lid of a pam spray can for my biscuit cutter. I get about 22 biscuits from this recipe. Total cost for this recipe is 1.00 per batch. Which is 4 cents approx per biscuit. 1/2 C cold crisco or 1 stick of butter. 1 1/4 cup cold water. Mix baking powder, buttermilk powder and flour together. Mix with a fork and sticky dough forms. Turn dough out onto a lightly floured surface and gradually add flour as needed. be large circle 3/4" thick. cut out Biscuits and gently put on a greased baking sheet. Preheat oven 450 degrees and bake for 13-15 minutes until golden brown. Remove & brush tops with melted butter. I also use this same recipe to make cinnamon raisin biscuits and add a little buttermilk and powdered sugar glaze to the top. You can also add 1 cup cheese and 1 teas. garlic powder and spoon by big spoonfuls on greased baking sheet to make garlic cheese biscuits. If you mix all the dry ingredients together in ziplock bags for camping trips you can just use 1 stick of butter and the water and bake in a cake pan that fits down into a dutch oven for campfire baking. Chief Advantages - These were very easy to prepare and would store well. Disadvantages - Funny after taste. Uses - They would make a good side dish and add variety to your preps. I was disappointed in this product. I had tried some instant sweet potatoes in the past that were hard to tell from fresh but they are no longer available so I was excited to give this product a try. I didn't notice when I bought them but they are mixed with russet potatoes, in fact they are mostly russet potatoes with a small amount of sweet potatoes and spices to make them taste more like the real thing but there was an off taste that I just couldn't overcome. DH said he liked them but I noticed he cleaned his plate except for a portion of the sweet potatoes. 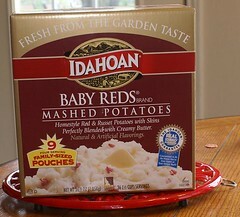 I like instant mashed potatoes just fine but these just didn't appeal to me and I am not a picky eater. I can count on one hand the foods I don't like. I don't think I'll be adding these unless my sons love them...they'll be here shortly to eat. Chief Advantages: Vegan and gluten-free, so works for many with food sensitivities. There are some peanuts and some tree nuts depending on the variety. Stores well and is compact. 23 vitamins and minerals and 70% organic. Some have chocolate for a small amount of caffeine, and a couple have green tea extract for a little bit more caffeine. Variety of flavor so you don't get bored. Disadvantages: Kind of dry, so I definitely recommend having something to drink with them. Uses: Energy bar or meal replacement. I pack them instead of MREs in my car because I can't find vegan MREs and I usually keep a couple in my purse for snacking. My Opinion: I LOVE these. There are a ton of flavors and I do like all of the ones I've tried. Some of the flavors might not be for everyone, so definitely try one before buying a bunch of a flavor. My personal favorite is the Cool Mint Chocolate (which does have the green tea) and the Cookies n' Cream. Yes, I did break the rules a little bit. This isn't a new item to me, it's one I've been eating for a year or so, but I thought they really needed to be on this list. Another thought on dried beans: about beans: As my username suggests I do some sprouting. I do alfalfa seed, mung beans, and others.... but as the best goes for protein I do alot of lentils. These mighty beans are awesome!Lentils have so much nutrition value it is pathetic. Takes about 2 days only and my 2 year old loves them and even my redneck princess, I don't eat anything step daughter munches on the in salads. If power is off you can sprout if you have water to rinse. I won't go into the whole spouting process here but it is definatly something to consider in the cold months when salad may not be readily available. Do a web search on sprouting, a mason jar. some screen or cheesecloth is all you need. You get all the protein plus some plant enzyme and chlorophyll nutrition. Do some grain like Quinoa and you get a complete protein when combined with beans ( all 9 essential ammino acids) Wild rice is sproutable but but not enriched or white rice Mahatma junk because well, wild rice technically is not a rice. dehydration of fruits: We do it all blueberries, plums, strawberries, bananas, etc, with refrigeration they last at least a year in tight ziplocs, use a vacuum sealer and even longer. Lots of protein powders last for a year, easy to mix with milk, water, or powdered milks. The bodybuilder stuff is full of vitamins that lean toward stress. Yes the focus is on physical stress but do you think mental and physical stress will not be experienced during some bad times? Anyway thanks for the read and hope I haven't brought up anything previously posted! SproutRanger mentioned protein powders... so I thought I'd throw in WHEY POWDER. Chief Advantages - 24g of protein per serving. Natural source of protein, doesn't take up much space, 2 year shelf-life, just mix with water. "Whey protein is considered to have the highest Biological Value of any protein source" (from the label). Comes in at least three flavors. Disadvantages - You might prefer protein from an actual food than a powder. Might not be something you'd eat anyway. Uses - Mix with water (or milk, but water for our purposes). I've also put some in with my morning oatmeal... probably it will mix with anything if you wanted. My Opinion - When I added weight lifting to my exercise, I started drinking a little of this after a workout, just so that I wouldn't be too low on protein. For this reason, for me, it's a "store what you eat, eat what you store" item. I only use it as a supplement, but if I was unable to leave my house suddenly, I'm happy I have it. It isn't a milkshake, but I think it tastes pretty good! I actually look forward to drinking it. And there are probably tastier versions than mine, I buy the cheapest. There's also WHEY PROTEIN ISOLATE -- it's a higher percentage of protein (I think 90% instead of 75%) but it costs more. If there's any major downside to this that I'm missing, let me know... I'm relatively new to this product myself. Just add an egg per serving and you have a real filling breakfast or lunch or supper for that matter. The expiration isn't for 3 years from now maybe more if you are willing to push it. This isn't bacon and hashbrowns but it isn't too far off. My husband and I had it with a couple eggs and toast and it kept us full for a long while. Chief Advantages - Stores well, excellent source of vegetarian protein that can be manipulated to taste like meat. No bad cholesterols or sugar. It is an alternative to soybean-based meat substitutes such as tofu when you start to go crazy with beans and rice. Disadvantages - Its dangerous to feed people with gluten allergies. My Opinion - This is a great way for meat lovers to start incorporating a bit more plant protein in your diet. I recognize that many people here will plan on hunting but on days when you miss your shot or you just can't scare up a rabbit this is definitely a great option instead of or on top of eating beans and rice. It is SUPER easy to prepare and easy to store. There is a nifty place where one can go to obtain storage foods called "BE PREPARED." One item they offer is tomato powder. Its a wonderful product that can be used in any way that tomato juice, sauce, or paste is used. A little of the tomato powder goes a long way. 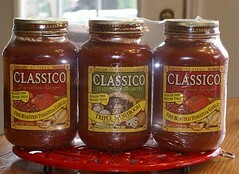 In fact, the can gives directions for making tomato sauce which I found to be the consistency of tomato paste. It takes up a lot less space than cans of sauce and the taste is equivalent to the commercially prepared sauces without the telltale taste of dehydrated products. With a few seasonings, beans, tomato powder, and water one can make chili; tomato powder, water, seasonings, and noodles makes into spaghetti or Italian soup or add veggies and have an Italian casserole; my first time using the tomato powder was spent experimenting with just dried/canned storage items (dehydrated onion, garlic, and other seasonings and canned veggies, etc.) I made a very nice tasting vegetable soup. Leftover meat with beans and tomato powder with onion and a little brown sugar and some prepared mustard makes a nice dish we call "Cowboy supper" (great with biscuits!) Its a very versatile item and well worth having in the food pantry. I forgot to mention on the tomato powder that a #10 can costs $24.95 and they list 1/4 cup of tomato powder to 1/2 cup of water = 1/2 cup of sauce (or 2 tbsp to 1/4 cup H2O = 1 servings with 96 servings in a can.) I found that the package directions make into a consistency more like paste than sauce and I estimate that the can will actually make into 1 1/2 to 2 times what it states. If you follow the can's directions, for $24.95 you can have the equivalent of 25 eight ounce cans of sauce. If you follow my powder to water dilution, you would have 50 eight ounce cans of sauce for $24.95. I never thought I would write something like this......I made Rice A Roni and I liked it.........wow! It's out there now. So, I am not as aggresively on track as many around here, but I just tried my first item. The brand NIDO was first launched as a whole milk powder in Switzerland in 1944, and was progressively introduced in other countries thereafter. Innovation and an entrepreneurial spirit have been Nestlé characteristics from the start. The story unfolds in the year 18 66, when a trained pharmacist, Henri Nestlé, in Vevey, began experimenting with various combinations of cow's milk, wheat flour and sugar in an attempt to develop an alternative source of infant nutrition for mothers who were unable to breastfeed. Given the high infant mortality rate, due mainly to the lack of an appropriate breast-milk substitute, Henri Nestlé's infant cereal responded to a real need. He launched this new product, Lactous Farina Nestlé, in 1867. His first customer was a premature infant who could tolerate neither his mother's milk nor any of the conventional substitutes, and had been given up by local physicians. Some other important firsts occurred during those early years. In 1875, Vevey resident Daniel Peter figured out how to combine milk and cocoa powder to create milk chocolate. Peter, a friend and neighbor of Henri Nestlé, started a company that quickly became the world's leading chocolate maker. It's whole milk! And not bad if cold. Expensive..I paid 5.49 in Publix, for a can that makes 3 quarts.